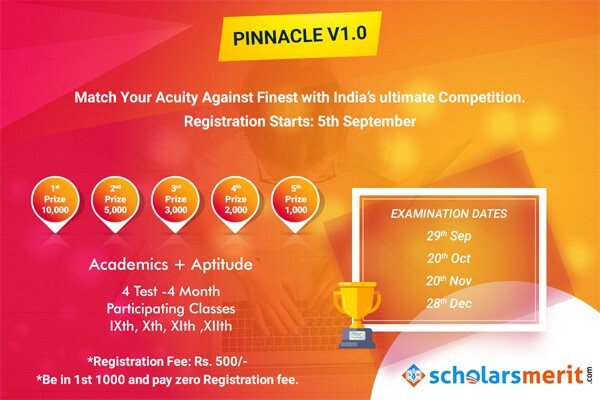 The Contest is organized by Scholarsmerit Online Pvt. Ltd. The Contest is valid only in India (or as applicable). Contestants eligible to participate in the Contest in accordance to the eligibility criteria specified in point no. 3 of these Terms and Conditions. a) Log into valid Facebook id. b) Must be follower of the page ?Scholarsmerit? c) Contestant must enter through the contest page only. There is entry fee of Rs.500/- and 1st 1000 registrations are free. Closing date for entry will be 26th September 2018. After this date no further entries to the competition will be permitted. The promoter reserves the right to cancel or amend the competition and these terms and conditions without notice in the event of a catastrophe, war, civil or military disturbance, act of God or any actual or anticipated breach of any applicable law or regulation or any other event outside of the promoter?s control. The winner will be notified by email and/or Facebook within 10 days of the last exam. If the winner cannot be contacted or do not claim the prize within 14 days of notification, we reserve the right to withdraw the prize from the winner and pick a replacement winner. The promoter?s decision in respect of all matters to do with the competition will be final and no correspondence will be entered. The winner agrees to the use of his/her name and image in any publicity material, as well as their entry. Any personal data relating to the winner or any other entrants will be used solely in accordance with current INDIA data protection legislation and will not be disclosed to a third party without the entrant?s prior consent. This promotion is in no way sponsored, endorsed or administered by, or associated with, Facebook, Twitter or any other Social Network. You are providing your information to Scholarsmerit Online Pvt. Ltd. and not to any other party. Scholarsmerit.com will judge the competition and decide on the winner each month. Scholarsmerit ?s decision as to those able to take part and selection of winners is final. No correspondence relating to the competition will be entered. Scholarsmerit shall have the right, at its sole discretion and at any time, to change or modify these terms and conditions, such change shall be effective immediately upon posting to this webpage. *First 1000 registrations are free (Use Coupon Code 201897499RS1110RR at checkout). Click on "Sign Up " button. Register yourself with Email Id. Select role Student from role. Enter OTP sent on email and verify. You will see details Page Pinnacle V1.0.